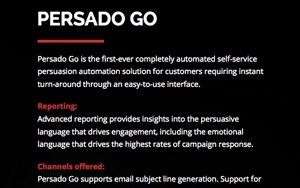 Persado on Tuesday announced the expansion of its Persado Go platform to six new industries, allowing marketers to optimize email engagement and ROI through Persado’s automatically generated, persuasive email subject lines. Persado Go is a self-service solution created for email that leverages Persado’s enterprise-level technology and proprietary database of organized, scored, and tagged language elements. Persado’s database is fed by significant in-market research and analysis, psychological research and millions of in-market interactions, says Lawrence Whittle, Chief Revenue Officer at Persado. The company's technology classifies emotional words and phrases into 19 distinct primary categories that can be leveraged to create emotional content and call-to-action language. The platform then generates messages that are optimized at a word and phrase level to be the most persuasive for the given audience being targeted by the email marketer. Engaging headlines are even more important when you consider the huge volume of email traffic being sent to consumers. The biggest issue facing the email marketing industry today is ensuring that the effectiveness of the channel continues to increase while competing against high volume and spam rates, says Whittle. “What and how you say is critically important. Email subject lines are the first impression and must be engaging to drive consumers to open the email. If that step is not taken, any other efforts to market to the consumer are lost,” he says. Persado Go is categorized per industry to align and optimize the language that the platform creates to unique characteristics of the specific industry using the service. “The more refined the language is by channel, by industry and by campaign, the more powerful and effective the messages are in persuading a customer to take an action,” says Whittle. Persado Go is now available for the fashion and apparel; consumer services; financial services; gaming and gambling, Internet and cable, media and entertainment, retail and ecommerce, technology, apps and software; telecommunications; and the travel and hospitality industries. 1 comment about "Is Artificial Intelligence The Future Of Email Marketing?". Paolo Gaudiano from Infomous, Inc., October 30, 2015 at 7:46 a.m. Thank you for providing this useful information, but I wish you would not have used the term "Artificial Intelligence" in the title, as this has nothing to do with Artificial Intelligence. While at the most superficial level machine-generated language may sound like AI, it is not. Posado seems to be using just statistics. Even their web site makes no mention whatsoever of AI, using instead the terms "mathematics and data science." How about "Is Data Science the future of email marketing?"